ColecoVision.dk Homebrew Section Presents: Daniel Bienvenu. Daniel is a kind of "Godfather" in the ColecoVision programming. Possibly one with the most experience on a technical view. He lives in Quebec, Canada. And Daniel are indeed a permanent member of the AdamCon. ADAM Com is members who meet once a year to exchange experiences on everything related to the ADAM and ColecoVision. Daniel has repeatedly organized and hosted this meeting. ColecoVision become his passion after he had worked with Vic 20 and other home-computers. Daniel has an amazing ability to get ideas for creating games, and he is not in the way of helping others. To illustrate that he would like to help others, you can see below on this label from Penguin Land. This label is rare, and may not be available in over 20 copies. 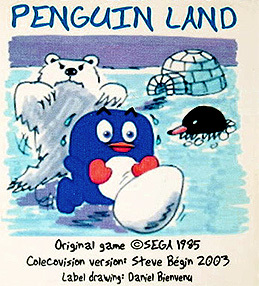 It's made of Bienvenu for Steve Bégin for use with the Colecovision version of Penguin Land from 2003. To spread interest more, was it agreed between Luc Miron from Team Pixelboy, François from CollectorVision and Steve Bégin to complete the game. The game was re-released in 2010 by CollectorVision, now with a new box and label design. The newest from his hand is making music for the CV. For example Michael Jackson, Theme from Ghostbusters and later Sabrina's "Boys boys boys". But also in Daniel's own games implements the digital samples. With the CV tools, he can do magic with his creativity. Daniel have also done a personal software menu for a ColecoVision multicart project. He have two prototypes left in his collection and used one of them to test his projects, and that is long before AtariMax USB 128:1 and the ultimate MultiCart ever came out. Daniel make his own tools and programs for the CV, and he updates them now and then. Furthermore, Daniel is also adept at the early existing programs as others have long put behind them. Marat Fayzullin was one of the first to program for ColecoVision, and some of Marat's tools is very useful for Daniel. Daniel put himself into things, and he like to find out how things can be solved. He read a lot and wrote it for public use. He have a very useful website, and was a former user on YouTube. Via YouTube could Daniel show what he means with all he wrote and came up with. You can actually better understand what is meant in a given situation. Some of Daniels first work is some tools, and very small games. Daniel is that person which has made most games and applications for ColecoVision ever. Maybe over 50 games and many useful tools also for ColecoVision. Daniel is a person that not go for games that are ported for the CV. Especially not games previously released for the MSX system. Daniel will like that the games are being done today must be original, but still be games as they themselves have invented. Therefore will you never see a game from Daniel as you already know, Dac-Man excluded. But you've got a position until you take a new one. Sega's Space Harrier is seen from Daniel's hand, and several of Sega's SG-1000 projects is seen. Many of those games Daniel has done is small and simple, and anyone can play them without being too difficult. Daniel will gladly share with others, he publish now and then the source code, and release many times a ROM for download. One of Daniels greatest game ever may be the Ghost Blaster release. It came out in 2009 in a cartridge format, with box, label and a manual. The cartridge shell was a special milky version with a transparent label. The game is a kind of Ghostbuster game and the title song is indeed from the Ghostbuster game of the same name. The difference here is that, Daniel himself wrote the song and gameplay note for note, and bit for bit. Also conventions from more familiar numbers, including Michael Jackson and last Super Ghouls 'N Ghosts theme. What a work he did here. He receives also several query plans from homebrewers to deliver either a piece of code to their games, or help with music and sounds for their games. Luc Miron, Jean-Philippe MEOLA and latest Michel Louvet are just some of the users that daniel has helped with his music and sounds. And some of the games are: CV Boxxle and for Youki's Smurf CV game, also Side Trak and Bomb 'n Blast just to name a few. 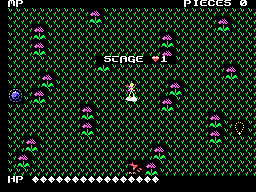 Also 3 melodies are done for the Venus Spa Video Game project, which starts in September 2010. Pick 'n Sticks Limited Edition. Limited to only 8 cartridges, with a good audio sample. Flora And The Ghost Mirror was the newest game from Daniel. The game was dedicated to his girlfriend Gabriella. 8 of Daniel's biggest ColecoVision games is rereleased via CollectorVision Games, complete in box.